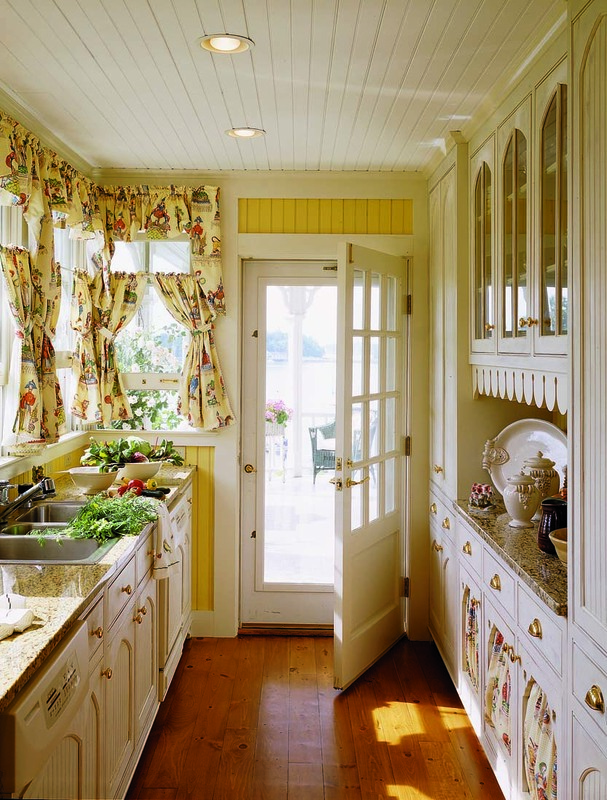 For many old-house owners hoping to create a historically appropriate kitchen, cabinets are an area of compromise. That&apos;s because the cabinets common today—continuous expanses of storage and workspace partnered with countertops—didn&apos;t exist before the 1920s. Before then, kitchens had precious few storage areas, and those that did exist bore little resemblance to the modular boxes now considered a virtual necessity in modern kitchens. So for many folks, the path between historical accuracy and cutting-edge convenience is a clear one—the more cabinets, the better. While it&apos;s fine to design your old-house kitchen however you choose, a look at how modular kitchen cabinets came into being affords lessons not only in design history but also on options for installing cabinets and other storage spaces that resemble those of years past. 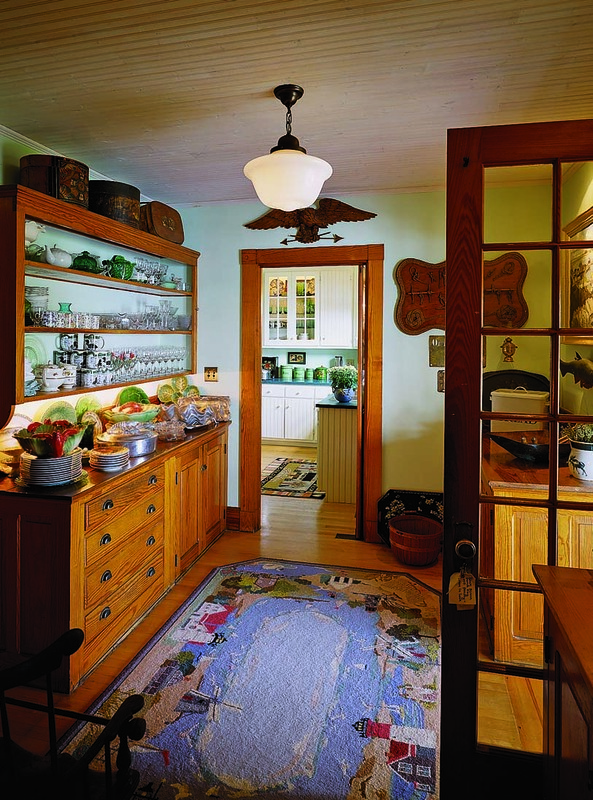 The story of modern kitchen cabinets is full of historical tangents, linked as it is with the emancipation of women, a series of time-and-motion studies, and an early 20th-century quest for efficiency in all things. 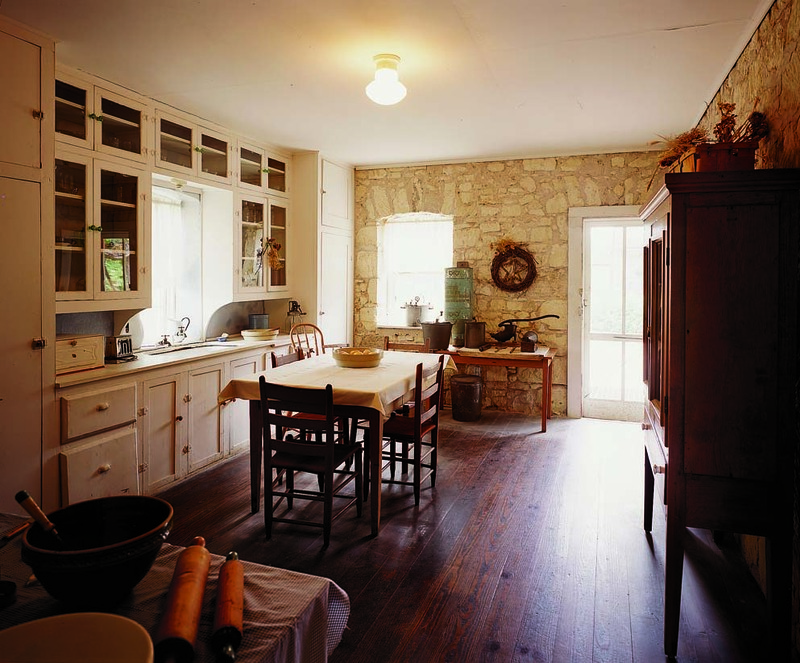 By modern standards, 19th-century kitchens didn&apos;t have cabinets. The rooms were large, open, and utilitarian with a simple worktable, sink, and stove all borne on legs. For most average homeowners, the center worktable and some wall shelves had to suffice for storing all of the cooking implements. In upscale houses, where teams of servants toiled over cooking and serving meals, a pantry provided additional storage. There, an expanse of built-in, floor-to-ceiling cabinetry, called a pantry dresser, was designed to keep pots, china, and food out of sight. While pantry dressers were handy, they were uncommon in the kitchen proper and appeared in more fashionable houses. The winds of cabinet change started blowing with Catharine Beecher in 1869. A sister of abolitionist Harriet Beecher Stowe, she was a doyenne of 19th-century domesticity who wrote several self-help books for women to create smooth-running households. According to Klaus Spechtenhauser, author of The Kitchen (2006), Beecher saw perfect working conditions for a housewife manifested in the functionally minimized galleys of Mississippi steamboats, and in 1869 she designed an ideal kitchen based on that model. Beecher&apos;s kitchen featured built-in bins for staples, such as flour and corn meal, thoughtfully placed to help ease the preparation of food. While her revolutionary ideas didn&apos;t immediately take hold, by around 1890 they had become the model for large, freestanding, legged cabinet units full of organized storage compartments, integrated racks, a small counter for food preparation, and a large half-round drawer designed for raising dough. These baking cabinets took American kitchens by storm. 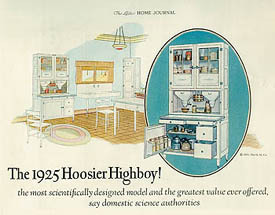 Baking cabinets, such as the Hoosier, touted in this 1925 ad from Ladies&apos; Home Journal, were designed to make cooking easier and housewives less tired by grouping together kitchen essentials. Commonly known as Hoosiers, a nickname derived from one Indiana company that manufactured them, the cabinets were advertised as helpful time-savers and necessary in every kitchen. "Save miles of steps!" screams one old Hoosier Manufacturing Co. ad, which went on to describe the bulky cabinets as careful housekeepers that save many steps each day and will save work for you. Appearing at the same time as the women&apos;s emancipation movement and a move to smaller houses in growing suburbs, the cabinets were a huge success. Popular thinking viewed fewer hours spent in the kitchen as liberating. Smaller houses, of course, meant less space for servants, so more and more upper-middle-class women began to do their own cooking. And deprived of domestic help, what housewife didn&apos;t want to make her workload a little lighter? Within a decade, another innovative woman would take up the cause of kitchen efficiency. Christine Frederick wrote a series of articles for the magazine Ladies&apos; Home Journal during the early years of the 20th century, as well as a number of books, on the subject of how to save time in the kitchen. The Martha Stewart of her day, Frederick went so far as to install a test kitchen in her Long Island home to investigate new ways of preparing and serving food in less time and with less physical exertion, in the hope of making domestic chores less tiresome. She argued for a more thoughtful layout of kitchen appliances and workspace. Equipment connected with these two processes (preparing and serving food) and their respective chain of steps should be arranged in a corresponding order. This principle of arranging and grouping equipment to meet the actual order of work is the basis of kitchen efficiency, she wrote in her 1920 bestseller, Household Engineering; it was revolutionary thinking for the day. In large part, Frederick&apos;s studies followed on the heels of similar experiments in the industrial world, particularly scientific management and efficiency studies made popular by Frederick W. Taylor, who sought to find the most efficient, labor-saving, and cost-effective ways to improve the manufacture of goods. Taylorist principles, which accelerated mass production, inspired a race for efficiency in all things, as highlighted by the work of people such as Frank and Lillian Gilbreth, scientific management specialists in Rhode Island. Professionally, the Gilbreths labored to find the best approaches for increasing efficiency and productivity in industrial settings. Privately, as the parents of 12 children (two of whom authored the book Cheaper by the Dozen),they became fanatical about making daily routines easier, going so far as to take moving pictures of their children to analyze their activities and eliminate extraneous motions. When applied to kitchens by Christine Frederick, Taylorist principles became a call for placing major appliances more logically around the room to eliminate unnecessary footsteps and movement that made household duties tiring. Frederick also advocated moving the cabinets traditionally reserved for a butler&apos;s pantry into the kitchen itself. As she explained in Household Engineering, the fewer the detached pantries and cupboards, the simpler will be the processes both of preparing and serving food. 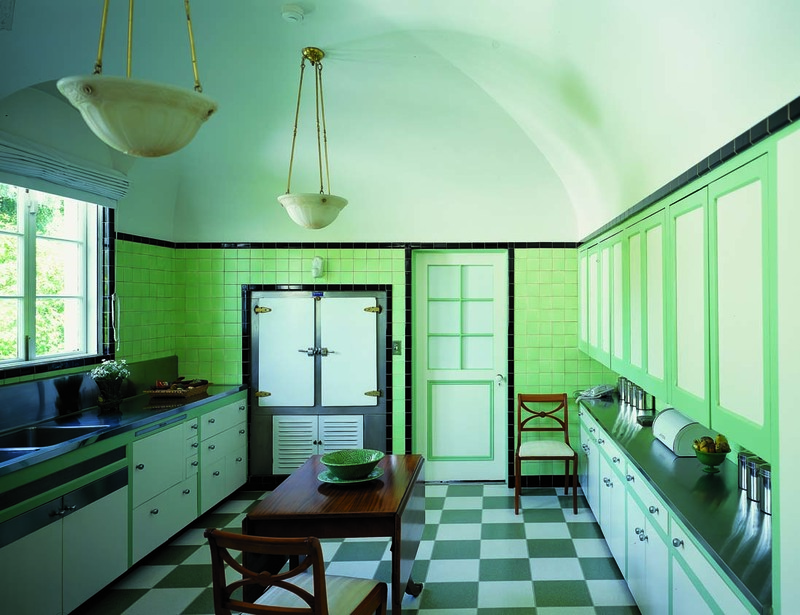 Frederick&apos;s ideas influenced the layout and design of kitchens, and her theories on step-saving movements around the kitchen are arguably the basis for today&apos;s work triangle layout of refrigerator, stove, and sink. It is, however, a little ironic that she met with fame and fortune and left the bonds of household slavery behind her by teaching other women how to perform the drudgery of domestic chores. All of this research into efficiency design came together in mid-1920s Europe, where, thanks to high population densities and a serious housing crunch, well-designed kitchen space was in much greater demand than in the United States. In 1925, the Frankfurt kitchen debuted, built around a unified concept and designed to enable efficient work; it would forever change the way kitchens were viewed. Designed by the Austrian architect Margarete Schütte-Lihotzky, the Frankfurt kitchen was the first to boast modular cabinets and thoughtful, fitted features that used every nook and cranny of space. The Frankfurt kitchen boasted waist-level cabinets with hinged fronts and overhead cabinets with sliding doors. There were rows of integrated aluminum drawers and bins made of oak (the wood repelled mealworms) for storing flour. There was a built-in garbage drawer for scraps, as well as a work counter, a rack for drying dishes installed over the drain board beside the sink, and a layout that optimized workflow. Similar kitchen designs were soon the standard throughout Europe, and it wasn&apos;t long before the designs became popular in the United States, too. A glimpse through early 20th-century catalogs illustrates just how quickly the change to uniform, fitted, modular cabinets trickled down to average consumers. In a 1910 edition of the Sears Roebuck catalog, there are just a few pantry dressers, but a 1927 Universal Millwork catalog devotes several pages to cabinets that were intended to fill entire kitchen walls. There are cabinets stretching from floor to ceiling (standard height was 8&apos;, 6") that feature waist-level pullout bins for storing flour and other staples; cabinets with rows of hinged doors, behind which were shelves to hold an array of kitchen utensils; and cabinets built around integrated sinks and refrigerators. There are cabinets designed to fit into a recessed wall or project into a room, as well as a choice of solid wooden or glass cabinet doors. For certain cupboard combinations, homeowners could choose to have the countertop made from one solid piece of wood. They could also order special features such as built-in spice racks, broom closets, or rows of drawers. Cupboards could be broken down into individual, modular units designed to fit narrow spaces (one cabinet sporting a stack of drawers, for example). 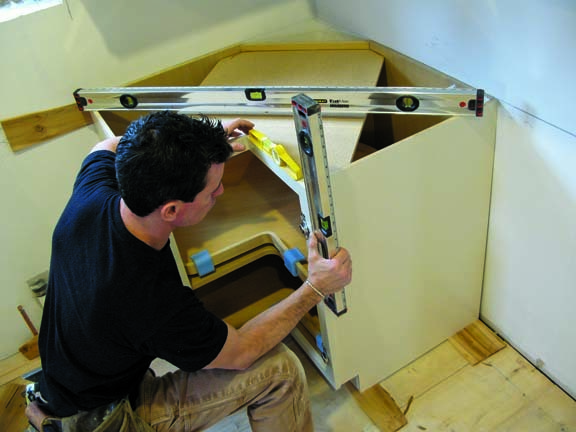 There&apos;s even a waist-high floor cabinet that features a recessed toe board, a design the catalog says allows one to get up close to the table while working. Those early modular systems, referred to in catalogs as kitchen cupboards, were built from a variety of solid wood such as oak, walnut, mahogany, or pine, with cheaper wood sometimes painted a shiny white. 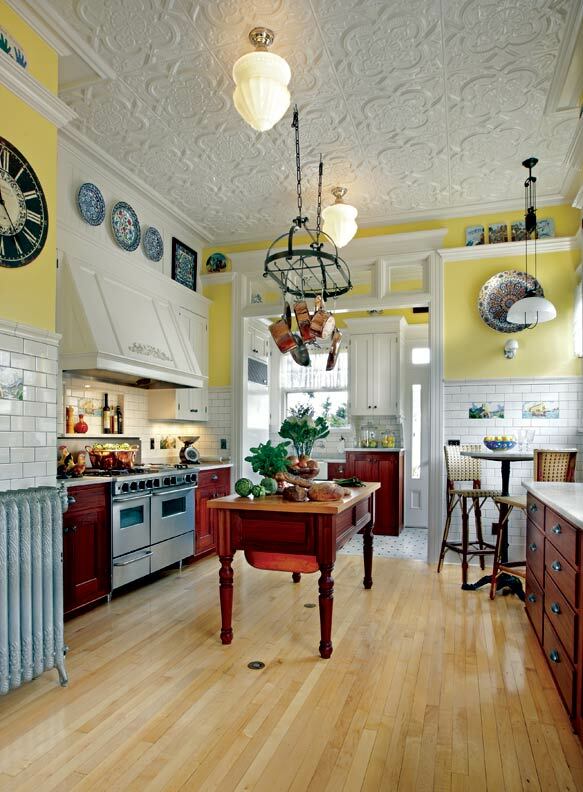 These ideas represented major breakthroughs in kitchen design that reverberate to this day. It should be noted, however, that none of these kitchen cupboards stood on support legs. Instead, they sat firmly and flatly on the floor, a new design element intended to alleviate the drudgery of yet another household chore: cleaning beneath bulky furniture.